A vast majority of children have recognised the McDonalds symbol before they were even able to speak. Overweight children have been given fast food in hospitals. Approximately 67% of parents in Ireland believe their obese or overweight child is of normal weight. McDonalds feeds approximately 45 million people everyday which is more than 15 times the population of Ireland. It has been stated that if you have eaten a Big Mac, large fries and large Coke you would have to walk non-stop for six hours to burn off the calories you gained. As fast food is a significant factor in contributing to obesity, increases in coronary heart disease, cancer, stroke, hypertension, gall bladder disease and diabetes can be partly blamed on our fast food culture. This excerpt from Primetime looks at how there are increasingly worrying signs that Ireland is facing an obesity epidemic. It is over 5 minutes long. Ever wonder how big McDonald's and other fast food companies are? Here is a video presentation presenting facts and figures about the fast food industry. A selection of Burger King ads. Do these models look like they are regular consumers of a Burger King diet? Here is David Beckham in an advert for Burger King for the 2012 Olympics. Do you think it is right for a sports celebrity to be a celebrity endorsement for a fast food company? Is it sending out mixed messages? What messages do you think they are? The sponsors of the London 2012 Olympics were Cadburys, McDonalds and Coca-cola. For an event which promotes health and sport this was an interesting choice of sponsors. Notice how many times McDonald's cups or logos appear in the advert below. 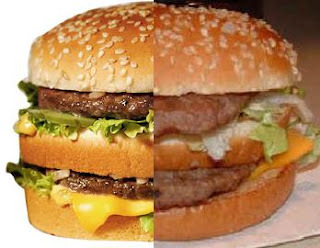 Why do you think McDonalds do this? Here is another take on this advert. Why do you think Coca-cola wants to be associated with the Olympics? Do you think it sends out any mixed messages to young people? Here is a very interesting video about the tricks advertising companies go to in order to make their food look better. Also remember that in todays world, these images can be photoshopped also just like the models explained in the previous thread. Do you think this is fair or not? Here is a comparison of famous products. The advertisement is on the left while the reality may be on the right. Type into Youtube: Jamie Oliver Nuggets and watch the video.